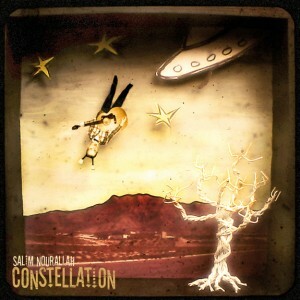 This week, Paul talks with Salim Nourallah about his latest album, Constellation. Art&Seek is launching a new podcast! “Track By Track” appears every other week on Art&Seek. Texas musicians play their new albums and discuss what went into making them with KERA “90.1 at Night” host Paul Slavens. Last week’s podcast featured Robert Gomez. This week, Paul talks with Salim Nourallah about his latest album, Constellation. PS That cover is wonderful! I really enjoyed listening to you (Salim) talking about each song. Great album, and brilliant lyrics. Please fix + link to mp3 for actual podcasting?! Sorry about that. Our server went down Friday, and when it was back up, a number of items (videos, images) still weren’t all there. But I’ve just played Paul’s piece with Nourallah, and it worked. Ditto the podcast. You might try them again. The podcast and the mp3 file are now working, thanks for telling us. it’s complicated, but basically, the server crashed, we uploaded a new version, and then when the server was restored, our hosting provider restored the original version. So that explains why sometimes it worked, sometimes it didn’t. Is there a way to download the podcast to listen? This flash player keeps reporting an error.